CelticWomanForum.com > The Cast > Éabha McMahon > How tall is she? Re: How tall is she? i just met Eabha... she's about the same height as me.. and i'm 5' 11"
About the heels - on their first DVD interviews, all of the girls complain about the height of their heels. Songs from the Heart on, the girls are pretty much in character shoes, which are about 1-1 1/2 inches in every size. So the heel height doesn't make as much difference now as it may have in the past, at least on the DVDs. In promotional photos, Mairead N, Mairead C, and Susan all wear super high heels. 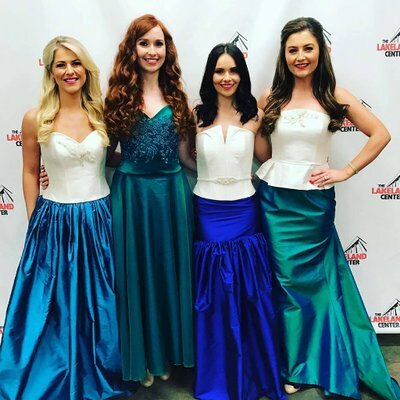 Here, Eabha & Tara both look much taller than Mairead C and Susan: https://pbs.twimg.com/profile_images/858775722470461444/Y4uQl6S0_400x400.jpg They are probably wearing their character shoes from the performance here.